“It feels like only yesterday that the show ended” is a phrase that I think gets overused a lot whenever it comes to sequel series premiere episodes. And as much as I’d love to not add to the growing pile of cases that overuse said sentiment, I can’t really help myself. 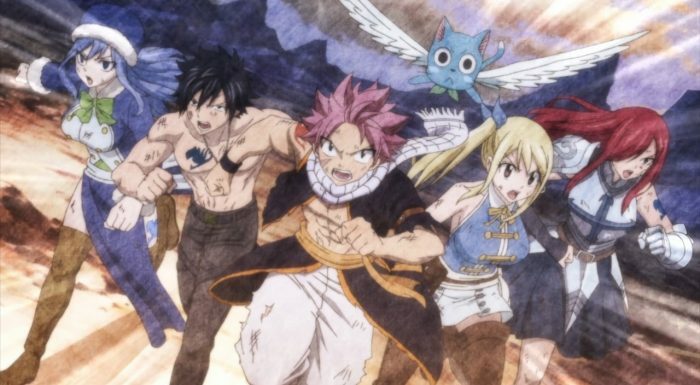 Fairy Tail, with its return and the first episode of its final season, picks up right where we left off with the story in 2016 (a good two years ago). I could certainly talk about, at length, how much I’ve missed this show, its characters and its unique charm. I’m not going to do that, however, because if you saw this week’s Fairy Tail episode, then you kind of already got a pretty solid reminder of Fairy Tail and its appeal. Its something beautiful, I think, when a show can just kind of speak for itself and doesn’t really require all that much description or analysis. Fairy Tail is something special, and if you’re watching the 278th episode of the franchise, then I don’t believe you need me to spell that out for you. Now, what is worth starting with, I think is the sense of weirdness that I clearly felt, jumping back into Fairy Tail’s story this week. What do I mean exactly? Well… In order to understand it all, I think we have to back to how the last series ended in 2016, with the two episodes that canonically precede the one we got this week. I remember commenting on how strange it was at the time, that Fairy Tail’s second last episode basically jumped into the very start of what certainly was the next big story arc. 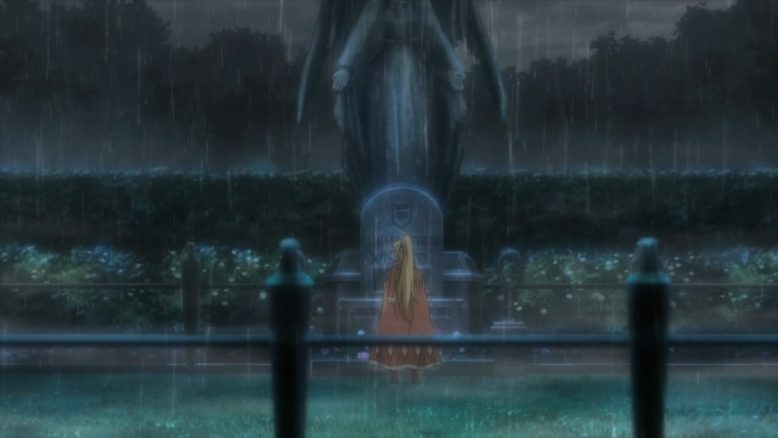 The show picked up a year after the events of the Tartarus arc, and this too after the recently concluded Fairy Tail Zero story had just wrapped up. If there was definitely going to be another season, then why not just wait and pick up the latest story arc then? Its was baffling decision then and its still baffling to think on now. That decision, incidentally, is also the reason for this week’s episode feeling a bit weird as a “series starter”. To that end, I’d almost suggest rewatching the last two episodes from the second series, if only because they tie so deeply into what we get on screen this week. But lets take a pause on that particular thought for a few minutes, and jump to an entirely different one. One of the things that I love about Fairy Tail, is how it handles its character moments exceptionally well. Sure there’s action, there’s intrigue, mystery and very emotional moments, but its the characters that have always been front and center in this show. So it seems fitting, that the franchise’s big return, focuses in on the characters more so than anything else. Now, while the show does a good job of recapping the events of the last arc before the franchise went on its hiatus I think its worth focusing in on one issue in particular. Basically, after the battle with Tartarus, Fairy Tail is disbanded and everyone kind of scatters into the wind. Natsu and Happy leave before even the guild itself disbands, and basically a year passes before we rejoin our beloved characters. Its here that the last two episodes of the show come into play, as Natsu and Happy come face to face with what consequences their actions actually brought forth on a particularly important character; Lucy Heartfilia. With Fairy Tail gone, and the losses that Lucy herself suffered in the battle with Tartarus, there’s not a lot left for the franchise’s female lead during that one year that the story skips over. 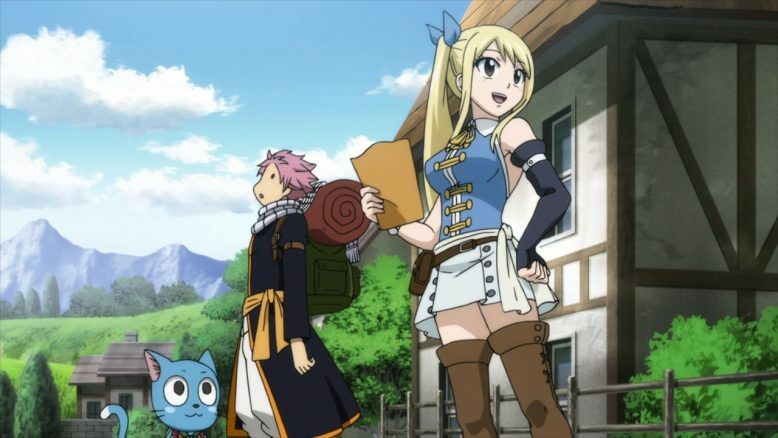 Lucy, much like Natsu, is extremely fond of the guild that she’s called home since the story of this franchise started. And while Natsu and Happy were in “the mountains” training, Lucy ends up trying to track all her old guild mates down and hopes that one day Fairy Tail can come back together. Its at this point that the second series ends, leaving things on a somewhat hopeful note. 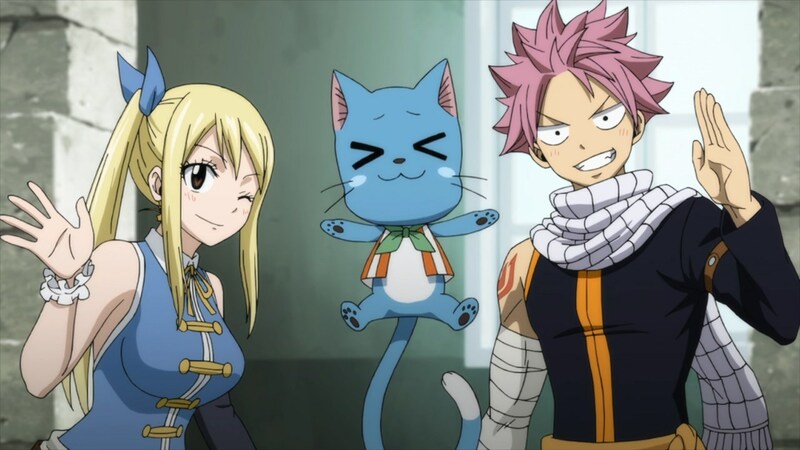 The idea being that Lucy, Natsu and Happy will be back someday, to reassemble the guild and continue their adventures. And this week, that story finally continues. If we ignore the rather cryptic start to the episode, with Erza, Gray, Natsu, Juvia, Lucy and Happy, then this week’s story actually focuses in on Wendy, and where she’s at since we last saw her. 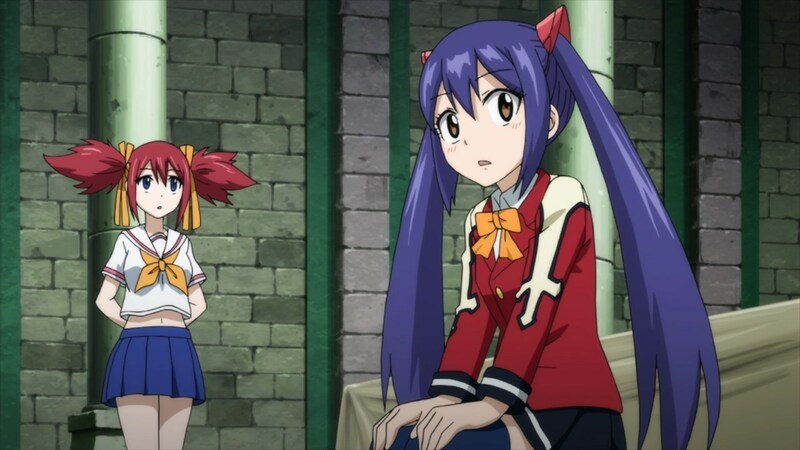 I have to admit, the whole reveal that Wendy had joined Lamia Scale, was a bit of a shocker and a downer. I realize that a year has passed since the Tartarus arc, but its a bit heartbreaking to see some of the characters that I saw as family, kind of move on from their experience at Fairy Tail. 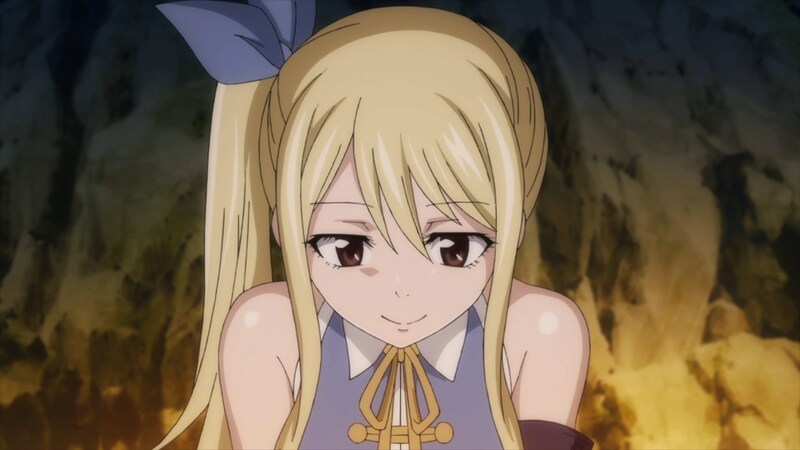 While Lucy, Natsu and Happy were more or less unable to really move on, Wendy was actually different. And it makes sense, you know, that Wendy would basically find a new home and kind of cope with the loss of her friends in a slightly different way than Lucy. 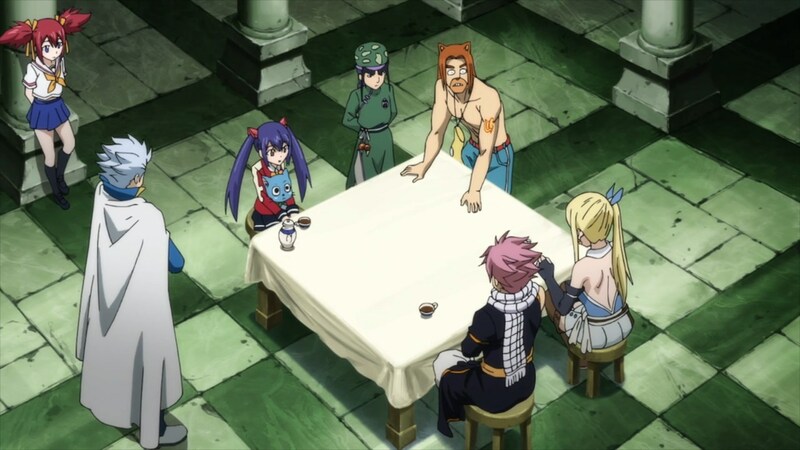 That’s the tragedy of the situation here, because with Fairy Tail gone, it seems that these people who loved and hung around each other all the time, have more or less drifted apart. If you’ve ever drifted apart from very close friends, then you’ll understand this sort of scenario and the hurt that comes with it. 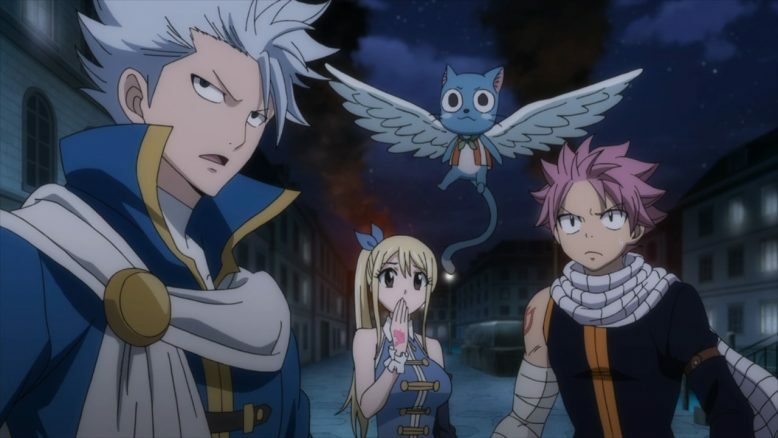 The moment where Wendy refuses to go with Natsu and Lucy to rebuild Fairy Tail? Its a massive gut punch, and one that really kind of brings the reality of the situation into the open. As much as Natsu and Lucy may want to see Fairy Tail come back together again, most of their other friends and comrades may feel differently. Honestly, to those who have moved on and begun a new chapter in their lives, its really quite difficult to simply slide back into the old status quo. Feelings are hurt, people have changed, and I think what awaits us fans of the franchise, is a pretty scary question. Can Fairy Tail actually come together again? And more importantly, do the characters that initially made it what it is, even really want that? If this week is anything to go by, then the answers to those two question are neither going to be easy, nor very pleasant. 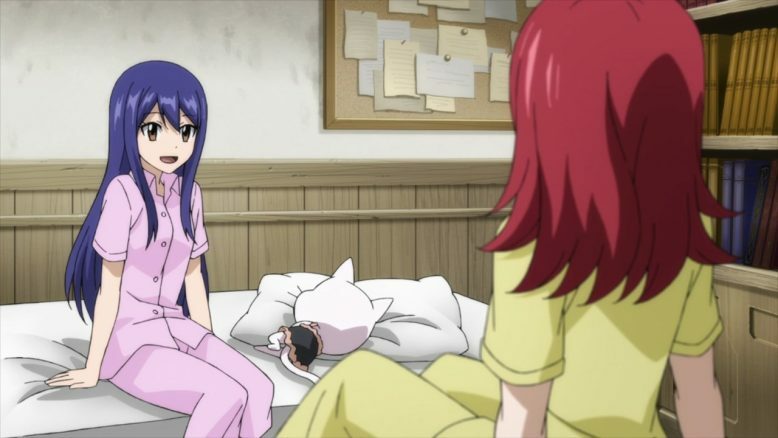 Wendy may be the first of many who have to work through their current responsibilities and issues before they’re able to come back to Fairy Tail (the guild) if at all. Which, honestly, is something that I really admire about both Fairy Tail as a story, and Hiro Mashima-sensei as a storyteller. It would’ve been really easy to just get the old gang back together and jump into whatever the deal is with Zeref, Acnologia and END/Natsu. But before all of that, what’s important is that the reformation of the Fairy Tail group be handled with finesse and extreme care. That is what we got this week, and while I won’t say it felt amazingly great, I do believe that it was a well done experience none the less. This is a part of the story where you’re supposed to feel the pain and loss that the members of Fairy Tail felt once they lost their guild and friends. Its a story of recovery and healing, and of trying to get things back to the way they once were. Its a sort of situation that many of us encounter in our lives, and its something that I love Fairy Tail as a story, for trying to capture and explore. Personally, I’m really rooting for Natsu and Lucy to succeed, and for Wendy to ultimately decide to join up with them. Part of me certainly believes that it will happen, if only because of all the talk from Sheilia and the rest of Lamia Scale. 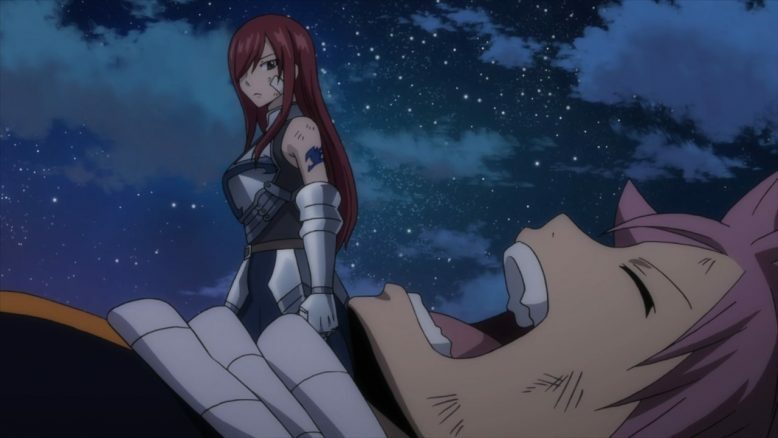 None the less, despite whatever may happen, its just tough to see Fairy Tail (the guild) in tatters, and I think if nothing else, this episode succeeded in doing something that I haven’t seen from anime in quite some time; It made me feel both a sense of nostalgia and a yearning for the same things that the characters in the show are fighting for. 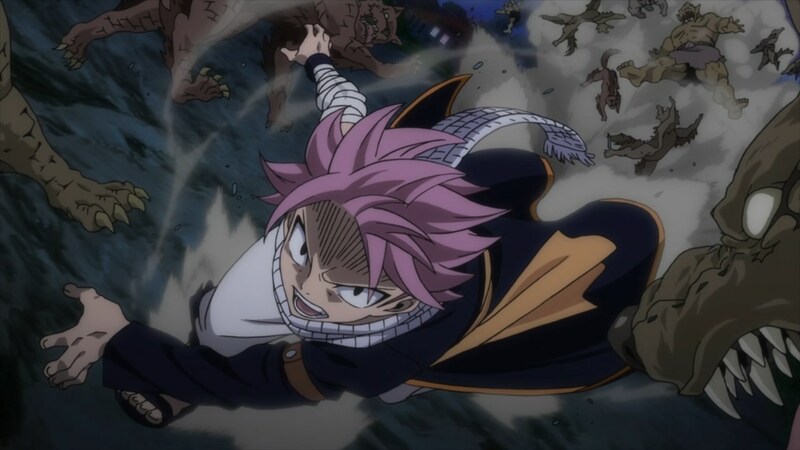 Thankkfully, despite being turned down by Wendy initially, Natsu is still very much determined to win her back and continue the restoration of Fairy Tail as a guild. Of course, before any of that can even continue, the town where Lamia Scale resides is thrown into chaos by the attack of a rival guild. As Wendy and Shelia, two girls who now have their own issues to work out with the potential return of Fairy Tail on the hoirzon, face this new threat, face off against this new threat, Natsu and the rest try to provide some much needed backup to their friends at Lamia Scale. 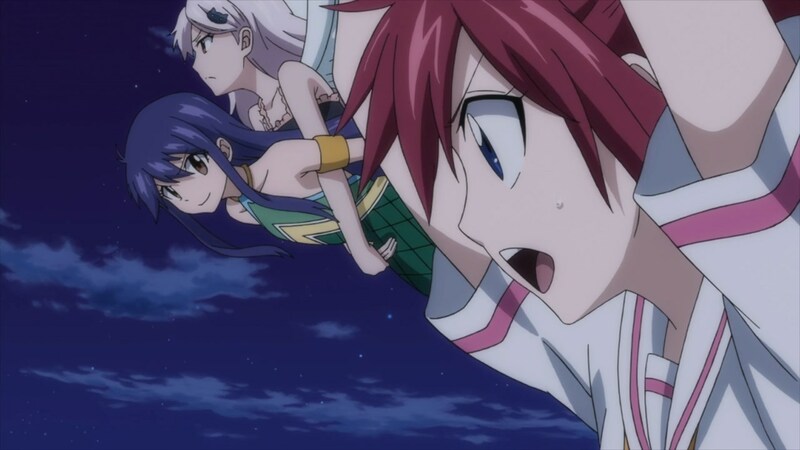 All of that culminates in a fantastic moment where Wendy, Carla, Shelia and Happy fly off to take down the Mage behind a huge monster attack on Lamia Scale’s city, with Natsu and the rest close behind them. Thus the episode ends with a tense moment as the two girls get ever closer to their big enemy, and Natsu basically dives head first into a battle with about a thousand insane monsters. Intense, riveting and emotional is putting it midlly. And its that sense of excitement and strong emotional resonance, that has always been Fairy Tail’s specialty. Personally? I’m just glad that the 2 year break that the show went on, hasn’t diminished that specialty, in the slightest. Beyond that, I suppose there’s certainly more to talk about, what with Natsu’s more fine tuned control of his Flames, Charles’ transformation magic and the whole talk of the Ten Saints and the new magic council, let alone the weird start to the episode and series with the whole “Fairy Tail’s final battle” thing. I’m going to save some of that for the next episode or two, as I’m sure we’ve got a pretty decent chunk of time ahead of us with these characters and this story, before we say goodbye for good. I will say that I think the animation this season is pretty darn solid as are the production values as a whole. Its not as good as the first season at its peak, nor is at as bad as some of the really rough points of the second series. As a whole I’d say everything presentation wise, looks pretty darn solid. Even the OP/ED themes are pretty darn decent, Neither of them really excited me in the same way that some of the franchise’s best have. In the end, I’d say this opening episode to the Final Season of Fairy Tail was a pretty darn good one. It really did feel like jumping back into a very familiar series, and the tone and emotion was definitely all there. I’m curious to see what happens next, and well, its just honestly great to have Fairy Tail back again. Saturday Nights are definitely going to be a real highlight of the week, so with that said, I’ll see you all next week.